Duas Mãos Quatro Patas is a Brazilian association which was formed in 2003 and is composed by a group of people interested in softening the suffering of abandoned animals. We initially got together to rescue 2 female dogs and their 11 puppies. Since then, we have been able to find new homes for more than 500 animals - adults, puppies and kittens. Nowadays, we are responsible for the maintenance of about 300 dogs which are kept in three different shelters. Our group has no sponsorship concerning expenses resulting from the treatment and maintenance of the animals at the shelters. The person, called godparent, who rescues the animal, becomes totally responsible for all the expenses concerning that pet. The association itself is responsible for maintaining the animals which do not have a godparent. In both cases, all our animals are vaccinated, neutered, medicated to eliminate worms, fleas and ticks and receive veterinary attendance whenever necessary. To do so, we raise funds by selling products from Duas Mãos Quatro Patas trademark, organizing garage sales and receiving monthly donations from about 30 supporters. However, this is not enough. We know we can’t help all animals which need a place to live even if it is temporarily. Our shelters have no structure to provide place for all of them. In order to ease this problem, we try to instruct people who wish to rescue dogs and cats, providing them with advice on how to proceed. 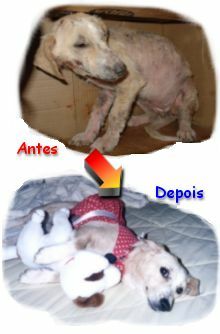 We also receive and publish e-mails with announcements of animals for donation on our website. Two Hands Four Paws is composed by a small group of people. Consequently, the impact of our actions may seem small if compared with the huge universe of abandoned animals. However, we have no doubt that we have made a significant difference in the life of those which crossed our path. Your donation will help us take care of our animals. We thank you in advance! Correspondent bank: Banco do Estado do Rio Grande do Sul S.A. New York Branch, New York, NY, USA. Beneficiary’s bank: Banco do Estado do Rio Grande do Sul SA, Main Branch, Porto Alegre, RS, Brazil. Please, quote DONATION on field 70. Correspondent bank: Banco do Brasil SA, New York Branch, New York, NY, USA. Beneficiary’s bank: Banco do Brasil SA, Main Branch, Porto Alegre, RS, Brazil. Correspondent bank: Commerzbank AG, Duesseldorf, Germany. Correspondent bank: Banco do Brasil SA, Frankfurt Branch, Frankfurt, Germany. Beneficiary’s bank: Banco do Brasil SA, Porto Alegre Branch, Porto Alegre, RS, Brazil.